U.S. Secretary of State Mike Pompeo meets with Kim Yong Chol, second from right, a North Korean senior ruling party official and former intelligence chief, for a second day of talks at the Park Hwa Guest House in Pyongyang, North Korea, Saturday, July 7, 2018. China refused to take the blame for a setback in North Korea’s path toward denuclearization as bilateral talks between Washington and Pyongyang went sour during U.S. Secretary of State Mike Pompeo’s visit there over the weekend. Trump’s comments echoed the stance of Republican senator Lindsey Graham, who said Pyongyang’s latest condemnation of the U.S. has “China’s hands all over” it. FILE - Sen. Lindsey Graham, R-S.C., speaks during a news conference on Capitol Hill, Dec. 6, 2017, in Washington. 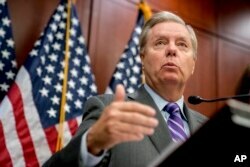 “If I were President Trump, I would not let China use North Korea to back me off of the trade dispute,” Graham told the U.S cable news network program Fox News Sunday after North Korean officials called their talks with Pompeo “regrettable” and accused the U.S. of making “gangster-like demands” on denuclearization. “This is totally baseless. China's position on the Korean peninsula is consistent and clear. We will steadfastly play a positive role and make constructive contributions towards pushing for the denuclearization of the Korean peninsula and peace and stability in the region,” Chinese foreign ministry spokeswoman Hua Chunying told press briefings repeatedly. Wang Dong, a professor of international studies at Peking University, said China is being scapegoated. “China can’t afford to be the scapegoat. What happened was the Trump administration is divided on its approach toward the procedures of denuclearization. [Pompeo] proposed a hawkish approach [during negotiations], which Pyongyang will never accept. North Korea has made it clear that its principle of step-by-step and simultaneous action has to be abided by,” Wang said, adding that both Washington and Pyongyang need to make compromises to narrow their gaps. 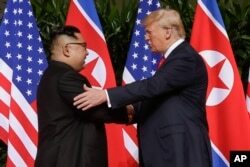 The professor urged Trump not to offset his diplomatic efforts after the Singapore summit, saying he should next persuade his hawkish aides to come up with a feasible approach on “full denuclearization” — one that differs from the past complete, verifiable and irreversible dismantlement (CVID) of North Korea’s nuclear programs. Accusations from U.S. politicians, however, have triggered nationalistic sentiment among Chinese netizens. But one day earlier, the majority of the Chinese audience actually sided with Pompeo and responded negatively to Pyongyang’s reluctance to pick up its pace of denuclearization. While China may be genuinely committed to pushing Pyongyang to denuclearize, it’ll inevitably bear the brunt of any back-and-forth from North Korea’s delivery, according to Tsai Tung-Chieh, a professor of international politics at National Chung Hsing University in Taichung, central Taiwan. That’s because Pyongyang can only look to China, currently its major trade partner, for economic gains in exchange for any progress of its denuclearization, the professor said. 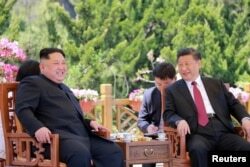 North Korea leader Kim Jung Un has invited Chinese President Xi Jinping to visit Pyongyang in September for National Day celebrations in a bid to strengthen economic ties. Kim has met Xi twice in the lead-up to his June summit with Trump and the third to brief Xi on the outcome of the talks. “Denuclearization will be next used as a bargaining chip and guarantee for North Korea to negotiate for [future] economic incomes. That is, the North won’t terminate nuclear programs without any economic gains,” Tsai said. After the Singapore summit, Trump may have eroded China’s leverage by directly engaging with Pyongyang, but that doesn’t mean China will be left completely out of the equation, the professor said. He added that Trump has won the “face” as the peacemaker, but will require China to deliver the “lining” on denuclearization as Beijing has a bigger say in awarding Pyongyang economic gains. And the U.S.-North Korea denuclear dealings will be decoupled from the Sino-U.S. trade fight, according to professor Wang. The Trump administration’s latest announcement to slap tariffs on an extra $200 billion of Chinese imports has sparked an outcry from China, whose commerce ministry said on Wednesday the U.S. move is “unacceptable” and hurts America’s own interests, China and the rest of the world. 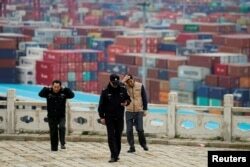 FILE - Security guards walk in front of containers at the Yangshan Deep Water Port in Shanghai, China, April 24, 2018. Wang, in addition, disagreed that Kim is planning on a second summit with Trump in Switzerland as he said such a summit isn’t in the interests of either country. “Pyongyang has more faith in South Korea and China. It remains skeptical of the U.S. To Kim, he will be under a lot of pressure shall he next meet one-on-one with Trump. Instead, he will feel more eased sided by South Korea and China and can certainly leverage the three-to-one advantage to constrain the U.S.” Tsai said.